A look at how globalization is evolving can be viewed through the lens of global value chains. Trade patterns are shaped by myriad business decisions within national production networks, not by the simple act of one country choosing to buy less from another. Topics include manufacturing, corporate competition, global consumption trends, technology, and automation as well as economic and labor market trends of the world. 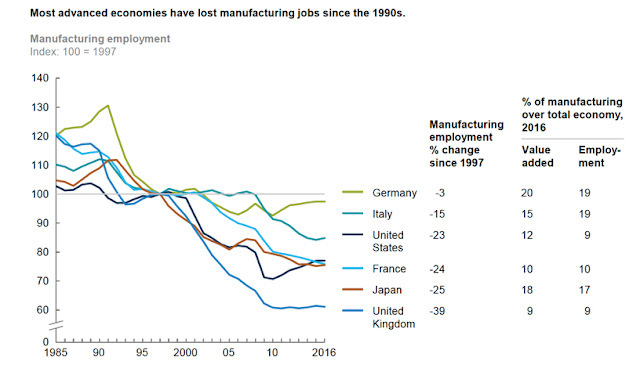 The dominant trend in the global economy is the decline in manufacturing jobs as result of a shift from high wage countries to low wage countries as well as from an increase in productivity resulting from automation and robots. 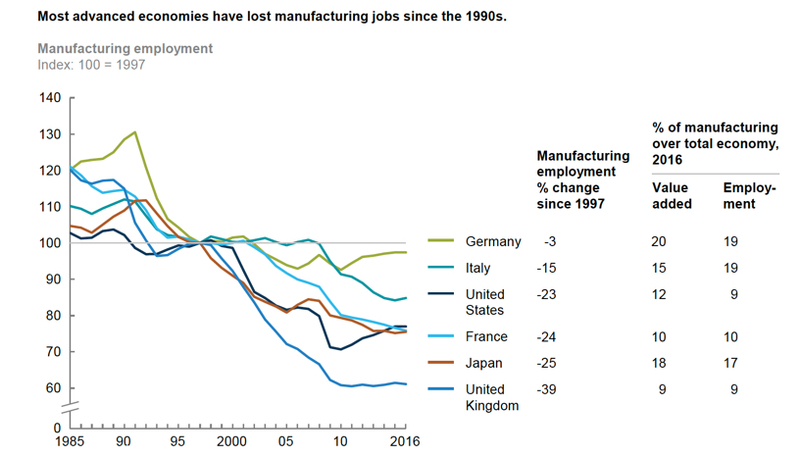 US manufacturing employment declined by 23% in 20 years while the annual value added from manufacturing kept increasing while relative employment was decreasing by 25%. Consequently, the diminished US manufacturing continued to be profitable. But profits were not reinvested into the creation of new jobs but to increase financial gains from transactions in the financial services sector. Although manufacturing employment decreased ranging from -3% in Germany to -39% for the UK, there has been a steady increase in the value added contributed to each country as China took over global goods production through exports. Developed countries (e.g. Germany, etc.) have tried to reverse the impact of job losses through subsidies or by means of policy measures such as tariffs. That was not sufficient to raise the GNP above global averages of GNP gains. Productivity gains did not compensate for job losses in France, Japan, United Kingdom except in the case of Germany that barely kept up its value added while keeping up their employment levels. In the huge losses in US manufacturing employment become irreversible as the workforce vanished from "rust belt" communities. Any restorations of declining industries such as in the case of coal, steel or mining could not be achieved even when competitive prices of manufactured goods were artificially increased through the imposition of import tariffs. Would it be possible to replace an unemployed manufacturing workforce by means of a shift to the services sector where a potentially greater value added could be delivered through gains in the share of the GNP that accrues from service offerings? Service would find it very difficult to replace goods production. 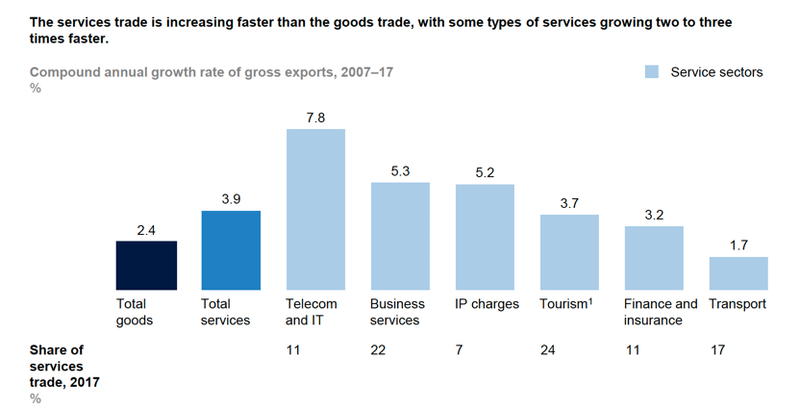 Though the global services sector is growing +0.4% over ten years, on a global scale such a small contribution remains inadequate to meet increased demands such as the growth in the population of +2.2%. The absorption of service is limited by local procedures and legislative restrictions imposed by the local elites protecting their privileges. Only services that offer a clear competitive advantage, on a global scale, such as information technology can hope to overcome the formidable limitations that are locally imposed on any imports. Only when a service can offer goods that require a high level of education or intellectual capital (such as patents) can be used for the penetration of services into the local economy. As manufacturing, with 20% of global exports, declines a rebalancing of global trade through services, with only 6% of global exports, offers unachievable prospects. The efficient production of goods, especially through robotics, will remain the basis for any future expansions in global trade in the foreseeable future. Therefore, for further expansion of global GNP the primary source of consumer demand for goods will be found in underdeveloped countries that presently have low levels of consumption. As the global population grows from mostly poor 7 billion people to over 9 billion people now demanding greater prosperity, such growth would continues dictating the delivery of low cost goods. The future in international trade of goods, not services, will therefore offer opportunities for the expansion of global international trade. China, has so far preserved a capacity to export low cost manufactured goods through investments in robotics. They will continue to dominate the global trade in the next decades. 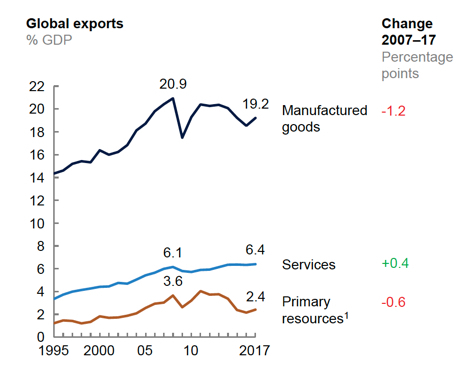 The US which has largely divested itself of the capacity to produced low cost manufacturing goods, will lose its position in global trade unless it finds ways how to innovative ways for delivery of new attractive services. China will continue investing in an expanding goods producing capacity. 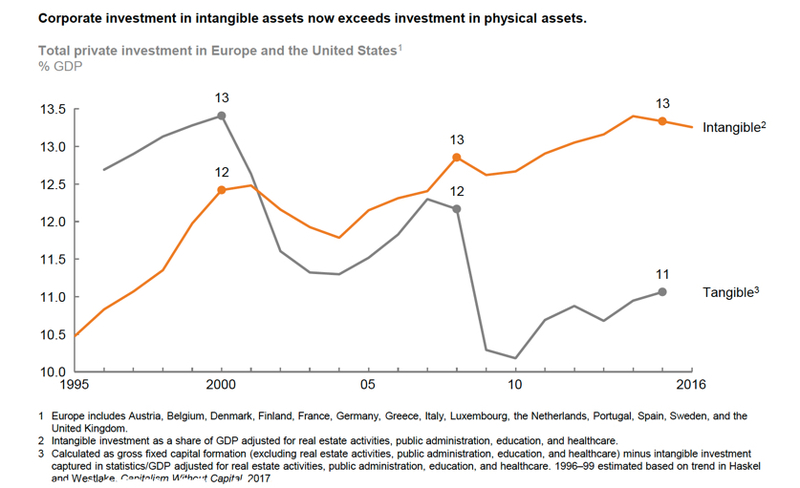 Meanwhile the US will have to compete for a share of a globally smaller services business. Under such conditions China is likely to be able to expand while the US will be shrinking its share of global trade. The increase in global services is taking place in the telecom and information technology (to 11% of the global market) and business services (to 22% of the global market) sectors. These require higher levels of education and experience. No wonder that well-researched reports on the future of the services business originate in analyses from firms such as McKinsey and PriceWaterhouse. The confrontations in the telecommunications and information technology industries is already taking place. The current competition for leading the installation of 5th generation services is already reflected in the low cost offerings of Huawei equipment as the world is already converting to superior technologies. At this time it looks like China is setting up for dominance. In the information technology domains the superiority of Apple's iPhone is vanishing as much lower cost devices from China take over while Apple is regressing to entertainment services that do not offer much of a gain for future GNP growth. Investments in plant and equipment will be always taking a second place when funding research and development efforts in support of innovation to achieve gains competitive and a superiority in services. 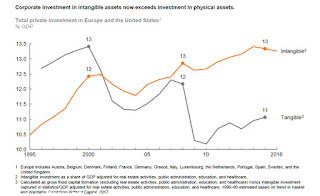 There is little doubt that continued investments in the dominant industries that support tangible goods will continue to be essential for generating sufficient cash in support of intangibles. 2018 data are not available but there is no question that inter-organizational communications are now expanding exponentially. Dominance in global trade will therefore depend on the laying of more fiber optic cables. Ultimately we will need space-based platforms that will avoid sea-bed point-to point connections. 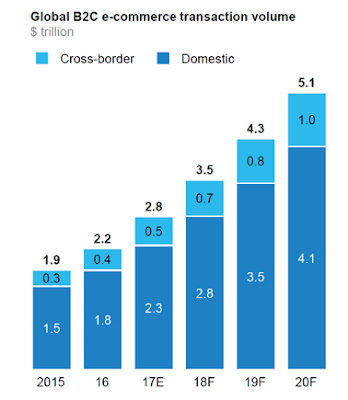 Though services will depend on computer-based communications, the main thrust will still remain in an increased dependence on direct business to consumer (B2C) electronic transactions. Such connections will depend on wireless connectivity of retail consumers as well as on communications with an infinite range of devices (e.g. billions). The current dependency of the US on point-to-point wired connections is not tenable as integrated network platforms take over connectivity. The underlying core design involves the integration of financial and health services. At present the US approach is to continue the current monopolies of banking (e.g. credit cards) and hospitals (e.g. medical records). The existing monopolies maintain their position on the basis of a demand for privacy that promotes the separation of personal identity from business transactions. With a different view of networking China, as matter of government policy that promotes the interoperability as well as surveillance, encourages the interoperability of all data. For example the centralization of records such as by Amazon should be contrasted with the decentralized design of the Alibaba platforms. A shift of telecommunications to e-commerce is accelerating. 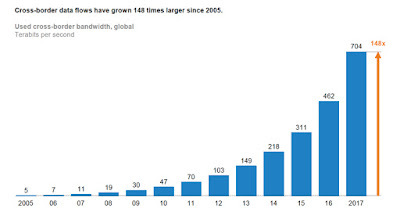 The growth will be taking place primarily by the shifting of retail trade to e-commerce. Cross border communications will increase with a rise of global trade but will be always concentrated on wholesale trade. The hardware and software to support the expansion of the telecommunications infrastructures in the developing countries will originate from a few global centers of innovation where the necessary networking knowledge capital can be accumulated. Though the "silicon valley" has been the source of innovation in the US, the current concentration on consumer services (Google, Facebook) is not providing the hardware production infrastructure that produces equipment that is necessary to support BtoC connectivity on a massive scale. As the silicon valley strategies vector the US economies to consumer services China will focus on the manufacture of technologies that stimulate the expansions of the GNP. Firms in Shenzen can be used as examples of how to organize for an information age economy. There will be a major reduction in transaction "overhead costs" (e.g. general administrative expenses) as AI (artificial intelligence) allows a greater automation of business processes. More than a half of future computer transactions will be completed on-line. Such transactions will be digital and will consume only a lesser share of global traffic. As an increased dependency on audio and video expands it will become most of the workload that creates global digital traffic. 2. International trade will continue to be dominated by the traded availability of low-costs products distributed through an efficient distribution chain. Production capacity will take advantage of differential advantages in labor and material costs. The maintenance of all products will be offered though on-line services. 3. The objective of international trade will be to construct a global value chains that supports an increasing number of consumers to be digitally linked by means of services offered by the goods producing organizations. 4. The immediate goal of the international trade will be to achieve a significant reduction in financial transactions through the adoption of an international currency.